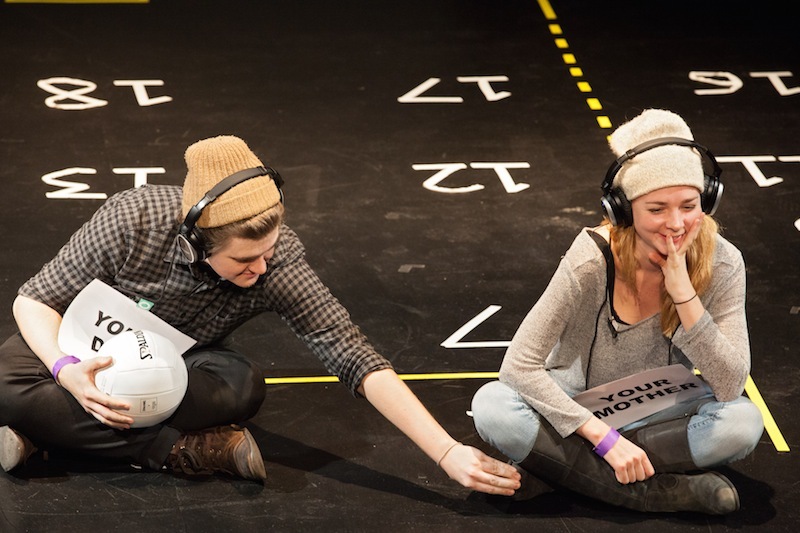 The New York Neo-Futurists’ new show, The Human Symphony, is a play with a lot of layers. On its surface, it’s an exploration of dating in the internet era, created and directed by Dylan Marron, best known outside of the theatrical world for his roles on the podcast Welcome to Nightvale and the webseries Whatever This Is. On another level it’s a symphonic metaphor, looking at the dating habits of humans as themes that develop and interplay across different movements, adding up to something much greater than any specific instrument’s line or any individual song. And on a third level, there’s the technical engine on which the show runs: six audience members are chosen to become the cast and crew, pantomiming along to a prerecorded soundtrack, moving props and set pieces, and even operating the sound system, all by following orders delivered to them via iPod. That’s a lot to chew on, which is both a strength and an occasional liability for the show. The Human Symphony begins with Marron choosing six performers from among the audience. (If you hate participation, don’t fear. You must self-identify as willing to be considered.) The time spent outfitting these cast members with their iPods and headphones and ensuring they understand how everything works stretches on a bit too long. This section, billed as “Instrumental Tuning,” builds tension in the audience around what exactly is to come, and leaves the viewers plenty of time to wonder what exactly the performers are hearing. The first movement offers the story of a relationship from the pre-internet days, when a volleyball game in Washington Square Park might lead to flirtation and then to marriage and a child. The second movement adds another 23 voices offering metaphors for the internet. Movement three returns to the initial couple, post-divorce, and offers a look at internet dating later in life. The fourth movement offers three variations on the theme of heartbreak through the eyes of young people meeting on OK Cupid, Grindr, and AOL chat rooms. A brief coda gives the narrator of the last vignette a final word on his vision of the internet, reinforcing the multiple layers of the show itself, reflecting on both the technological aspect of the network and the human aspect of connection. On some level, your experience of the show as a whole may hinge on the quality of the volunteer performers. The night I attended, they hit their marks but offered very little else. Perhaps they were instructed by the voice whispering in their ears not to ham it up too much, or maybe they were so concerned with following the instructions, they didn’t have time to add facial expressions to their motions. As an audience member, not knowing what the performers were hearing, being aware of this secret layer to the play but not having access to it, was at times distracting. But this also strengthened the thematic core of the show, in some ways paralleling the uncertainty we feel when participating in online dating: how much do we really know who’s on the other side of that screen? While The Human Symphony never explicitly goes down the Catfish path of online dating as a vehicle for identity manipulation, it dances on the line between truth and fiction, exploring when expectations and reality don’t match. The Neo-Futurists’ watchcry, while never explicitly invoked in this play or in the program, was ringing in my ears throughout the evening: “We are who we are, we are where we are, we are doing what we’re doing, and the time is now.” A play that invites audience members to act along to pre-recorded dialogue challenges each of those four assertions. And it’s never clear how much of the soundtrack is drawn directly from the interviews Marron conducted in putting together the piece, and how much is a performance by voice-over actors reading from the script Marron composed. The voices are uncredited in the program. The Human Symphony is at the New Ohio Theater January 22 through February 14, 2015.